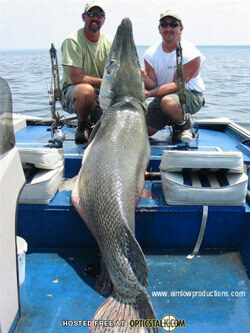 World Record Alligator Gar | FISHING FURY - A Fishing Blog with Attitude! There are a handful of fish I really want to catch before I die. To be added to this list, the fish have to either look really amazing, fight really well, or are just be incredibly large. The alligator is all of the above. These mean loooking fish are found in the south eastern United States and can grow up to 12 feet long. These fish have been known to attack alligators and humans in rare cases. The rod and reel world record has stood since 1951, caught by Bill Valverde, weighing in at 279lbs and was caught in the Rio Grande, Texas. I wasnt able to find pictures of the fish but I thought I would share these photos of what looks to be an alligator gar well over 200lbs, one site has it listed as 244lbs. This gar was caught bow fishing and is the biggest one I could find a picture of. Watch the video of the catch on YouTube. My uncle is Bill Valverde(deceased) we have an old pic of him and my grandfather with the fish. I’ll get it scanned and emailed to you if you would like. Fishing Fury - A fishing blog about two guys with a serious passion for fishing, the great outdoors, crazy adventures, and heart-pounding entertainment. Just wondering if we may be related. My immediate Valverde relatives are located in Southern California. I’m 64 but had a cousin Johnnie, a year older than me, who moved to Texas a number of years ago. He has since passed away. His parents names were Johnnie and Carmen and he had 5 siblings. Valverde is not a very common name so I thought just maybe. You never know. We live in the RIo Grande Valley. I’ll have to ask my mom if the names ring a bell. My name is Joseph an I live in the RGV(Edinburg) as well, im 21 and I’ve been trying to catch an alligator gar for a while, where do you think the is best place to catch one down here?? I am Bill Valverde’s youngest daughter. I was told dad’s fishing story many times while growing up and have a recording of my dad telling his tale. I haven’t listened to the tape in a long time but I will tell what I remember. Dad was fishing in the Rio Grande outside Mission, Texas, about where Anzalduas dam is now. There was a draught at the time and Dad said the river was extremely low. He had gone out to fish for catfish and had his hooks weighted and baited for bottom fishing. My grandfather and (as family lore says)a couple of wetbacks helped dad drag the gar up on the bank and on to the car. It was brought into town tied to the top of the car. My grandfather, Trini Valverde, was the bookkeeper at a location meat packing business (Leal’s) so he had access to a large scale. The fish, as you see in the photo, is hung on the swingset in the yard. As chance would have it, Bentsen State Park is just outside of Mission and there “someone” (can’t remember his name, though it is on the tape) was down from the Austin Parks and Wildlife Department (Austin is Texas’ state capitol) doing some work at Bentsen Park. Word got to him about Dad’s gar and he came to the house to see it. He took the length/weight information back to Austin along with the head. My Mom said that though my family didn’t eat gar, there were many neighbors who did and they came to get large slabs of the fish to eat. As to the question about family in California. We do not have any family there. Both my father’s parents were born in Tamauilipas in northern Mexico. a good reason not to swim in the river! I’m sorry to hear about your dad. MY mom, Alicia Guerra Martin (daughter of Dario Guerra) is one of your dad’s cousins – from Mission. I can remember seeing the picture of that huge gar on the swing set at my grandparents’ house more than 30 years ago! Amazing what we come across on the internet! I think the photo from Sam Rayburn is pretty cool, but am glad the record is still Bill’s!!! The new current world record by length was cought by Johnny Morris owner of bass pro shop. out of our private lake. You can see a picture of it on my website at http://www.garzillabowfishing.com we guide for monster alligator gar with rod n reel or bow. I agree that this is a great fish but in most states it is against the law to hunt them with a bow. I live in Texas and the bag limit here is 1 per day. I know a few fishermen that have had their hunting and fishing license taken away for life. If people continue to bow fish these beautiful animals there will be none for our kids/grandkids to enjoy. I have swam with them while snorkling and have caught many while fishing. Every time is a magical experience. Many people think that they kill game fish but that is not their prefered prey. Check state laws before hunting/fishing. thats a BIG fish so that makes me wonder what did you do with him after you found out that he was a world record ???? I’m agreeing with “Upperhand.” That “world record” gar, or a reproduced mount of it, is on display at Bass Pro here in Springfield, MO. They even have a plaque stating that it’s the longest gar ever recorded, and it’s a blatant lie. The record longest gar ever caught came out of the Moon Lake in Mississippi in 1910 and measure almost 10 feet long, and the current record for “largest” gator gar is 8’5″ and weighed 327 lbs. It was caught in Mississippi also. I have likewise scoured every record book imaginable and found not one mentioning Johnny Morris’ “world record” alligator gar. I used to live on Sam Rayburn a couple years back. They do get pretty big! 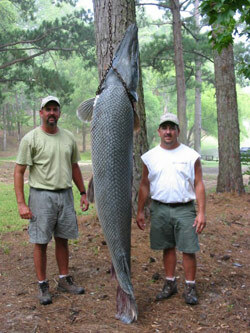 The current world record for the largest Alligator Gar caught on rod and reel is 279 lb (127 kg). and The largest taken by bowfishing is 365 lb (166 kg). Dale, when was it caught? This post is from 2007, if there has been a new record since they we definitely want to know about it! bowfishing is for pussies thats why most inbred yanks prefer this method. Damn grazie, who pissed in your kool-aid. I always wonder why when people talk big gar, they never mention Falcon Lake. I dont know if I would want to get in a fight with a guy holding a bow. I have a photo of the Aligator Car that was bow hunted. Jonathon I will email it to you so you can post it. Not sure if I can in the comments here. Dont see the option.